This lively Nor’easter is packed with fresh lobster, creamy chowdah and berry scones as you explore the cozy beaches, craggy shoreline and fishing wharves of Mount Desert Island. Preppy Bar Harbor is a yachtsman’s delight and a bastion of Down East style. You’ll ride through Acadia National Park on Rockefeller’s historic carriage roads and meet memorable characters on boats, taverns and strolling through the village greens and parks. Enjoy a picnic under the pines and expect deluxe comforts at charming seaside inns where surf and seagulls lull you to sleep. This tour offers a full range of easy terrain mixed with moderate hills and is ideal for both beginner and experienced cyclists. Approximately half of the rides are on packed gravel paths within the national park. Our VBT van support shuttle is available for those who would like assistance with hills. 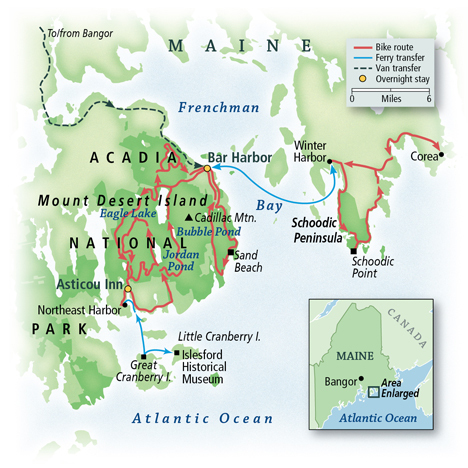 Make your own arrangements for travel to Bar Harbor. 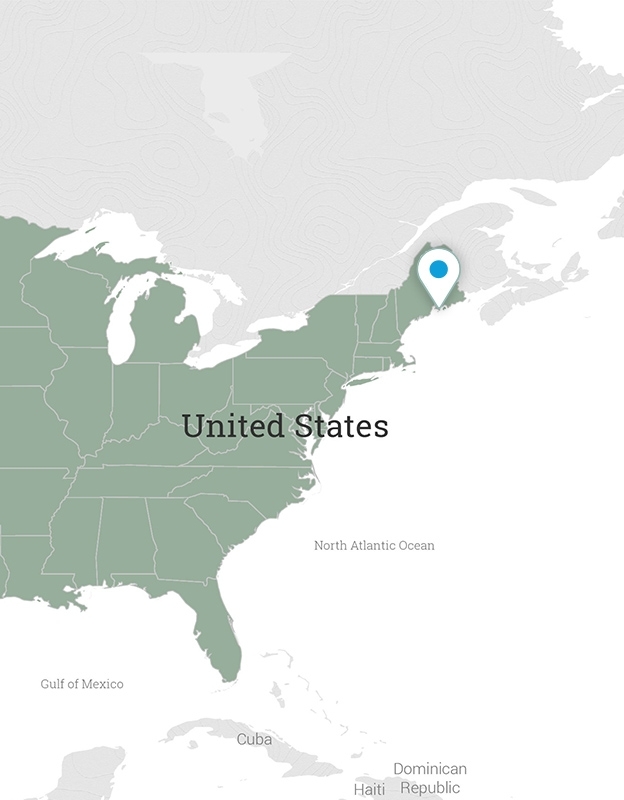 If you’re flying to Maine, VBT will offer a shuttle from Bangor International Airport. The shuttle works on a “show and go” basis and will make its only departure from the airport to the inn at 1:00 p.m. Shuttle reservations are not required or available. Upon arrival at the airport, please exit the doors in front of the escalators and cross the street to the Four Points Sheraton to await the transfer. Your shuttle bus will carry “West Bus Service” titles, and the driver will be holding a VBT sign. If you are arriving after this shuttle departs or your flight is delayed, you must make your own arrangements to reach the Bar Harbor Inn. Guests driving to the tour may leave their car in the Bar Harbor Inn’s parking lot for the duration of the tour at no charge. Your group meets at the Bar Harbor Inn. After settling in, explore this lovely seaport town until mid-afternoon. From 1:00 to 3:00 p.m., join your VBT Trip Leaders for a safety and bike-fitting session, followed by a short warm-up ride. At 5:00 p.m., meet again for a tour orientation and welcome reception before your 7:00 p.m. lobster bake dinner at the inn. After breakfast, we catch a morning bike ferry (45 minutes) across Frenchman Bay to Schoodic Peninsula, the only section of the park on mainland Maine. A local’s favorite, you will ride along the shoreline through classic Down East fishing villages. View sea birds, crashing surf and working lobster boats as you ride to our lunch spot. Enjoy the peace and serenity of Schoodic Point before riding back to Winter Harbor for our return ferry (45 minutes) to Bar Harbor. You’ll enjoy dinner on your own this evening. Begin your morning with a short ride to Compass Harbor, site of George Dorr’s Old Farm ruins. A short hike (1 mile round trip) takes you to Dorr Point with views of Compass Harbor and the Porcupine Islands. Continue to Sand Beach, where you can relax on the shore. After lunch at the Fabbri Memorial Picnic Area, cycle back to Bar Harbor or, for additional miles, continue on the Park Loop Road past Cadillac Mountain Summit Road. This afternoon, you may choose among optional activities (at your own expense): guided sea kayaking in Frenchman Bay, a whale-watching excursion or a sunset cruise on the schooner Margaret Todd. You may also choose to browse Bar Harbor’s charming gift shops and boutiques. For dinner on your own, enjoy one of the fine restaurants in town. Today, you’ll cycle on Acadia’s famed car-free carriage roads, which were established by John D. Rockefeller. Your loop takes you around Eagle Lake to Jordan Pond before enjoying lunch on your own. Consider stopping at Jordan Pond House for elegant fare, including their famous lobster stew and golden, lighter-than-air popovers. This afternoon you may bike or hike on the Carriage Trails to your inn. In Northeast Harbor, you’ll find attractive boutiques, galleries, gardens, and eateries. Your accommodation here, Asticou Inn, overlooks a beautiful protected harbor full of sailboats and luxury yachts. Take advantage of the inn’s amenities, which include a clay tennis court and an outdoor swimming pool. Dinner will be at a local restaurant tonight. Your exploration today is done both by boat and on foot. After a leisurely breakfast at the inn, you may enjoy an optional visit to the Azalea and Thuya Gardens. Afterwards, you’ll board a lobster boat to Little Cranberry Island. This pristine hamlet hosts a year-round community of lobstermen, boat builders, craftsmen, and “rusticators” (those happy few who opt for country living). You’ll visit the Islesford Historical Museum before boarding the boat back to Northeast Harbor (a 30-minute ride). Enjoy your final farewell celebration dinner at the inn. VBT has arranged facilities for you to use between noon and 1:00 p.m. to shower and change before leaving. The innkeepers of the Bar Harbor Inn ask that you depart by 1:00 p.m. A return shuttle to Bangor International Airport will depart the Bar Harbor Inn at 1:00 p.m. (travel time approximately 1 hour and 15 minutes). For this reason, we suggest a flight departing no earlier than 4:15 p.m. Established in 1883, this historic inn overlooks the placid waters of Northeast Harbor and is adjacent to Acadia National Park. It has 48 rooms—31 in the four-story Main Inn and 17 in four smaller buildings known collectively as the “Asticou Cottages.” The inn features modern amenities, including a heated swimming pool and a clay tennis court. The inn is also home to Peabodys, an elegant harborside restaurant serving local and regional favorites such as lobster bisque, New England clam chowder, and Napoleons made with fresh Maine blueberries. The beautifully landscaped Azalea Garden and Thuya Garden are within easy walking distance. Both are wonderful destinations. Built in 1887, the inn is close to all of Bar Harbors attractions. Take in views of Frenchman Bay through the dining rooms picture window. The inns luxury spa opened in spring 2006.